Dezeen Wire: six buildings have been shortlisted for this year's RIBA Stirling Prize, including the London Olympic Stadium by Populous (above) and two projects by OMA. » Sainsbury Laboratory, Cambridge by Stanton Williams. The winner will be announced at a ceremony in Manchester on 13 October. Update: six buildings were also shortlisted this week for the Carbuncle Cup award for the ugliest building completed in the UK over the last year - read about them here. The shortlist for the prestigious 2012 RIBA Stirling Prize, revealed today (22 July 2012), celebrates the best of new British architecture. The shortlist features six exceptional and completely different buildings from across the country which will now go head to head for architecture's highest accolade and a £20,000 prize from the Royal Institute of British Architects (RIBA). The RIBA Stirling Prize is now in its seventeeth year; the 2012 winner will be announced at a special event in Manchester on Saturday 13 October. The seemingly simple yet highly innovative London Olympic Stadium, the thoughtful and intimate Maggie's Cancer Centre in Glasgow, the stunningly original Hepworth Wakefield gallery in Yorkshire, the beautifully detailed and rule-breaking Sainsbury Laboratory for plant science in Cambridge, the New Court Rothschild Bank in London that rises high whilst opening new views at street level, and the crafted and careful reincarnation of the Lyric Theatre on a small suburban site in Belfast are all in the running for the 2012 RIBA Stirling Prize. The buildings on this year's shortlist are all highly-crafted buildings and use rich materials, with exceptional attention to every detail. These are buildings that clearly value the individual and visitor's experience; from the very personal and peaceful Maggie's Cancer Centre to the new Olympic Stadium, which despite its enormity has an atmosphere of intimacy for every spectator. Heritage and education are strong themes in this year's shortlist with the success of the Sainsbury Laboratory housing Darwin's collection, New Court's careful integration of the Rothschild's art collection into its design and both the Lyric Theatre and Hepworth Wakefield skillfully creating exceptional new homes for regional arts. David Chipperfield Architects are the only previous RIBA Stirling Prize winner amongst this year's shortlisted architects, having won in 2007 for the Museum of Modern Literature in Marbach, Germany. This is the eighth time that David Chipperfield Architects has been shortlisted for the RIBA Stirling Prize, and the third year running; they now match Foster + Partners who have also been shortlisted for the prize eight times. - The Hepworth Wakefield is characterized by a series of 10 small, irregular, trapezoidal blocks that make up the structure of the gallery, giving it a sculptural appearance, in reference to its contents. - From the outside, the gallery is interesting to look at from any angle with the smaller blocks complementing the scale and form of the existing industrial buildings on the site. Inside, the ten blocks create a series of relaxed and intimate exhibition spaces, with great flow and movement between interconnecting rooms. - The building responds imaginatively to its riverside location. Being at the head of the river divide, two sides of gallery are river facing. The gallery rises straight from the river and the whole building is reflected in the water. Carefully placed windows offer strategic views. - The gallery sources renewable energy in the form of heating and cooling from the river's flow. - The distinctive dusky mauve colour of the concrete gives the building a unique identity. - The stadium has been designed so that it can be taken down and reused in another location - or taken apart and made smaller. 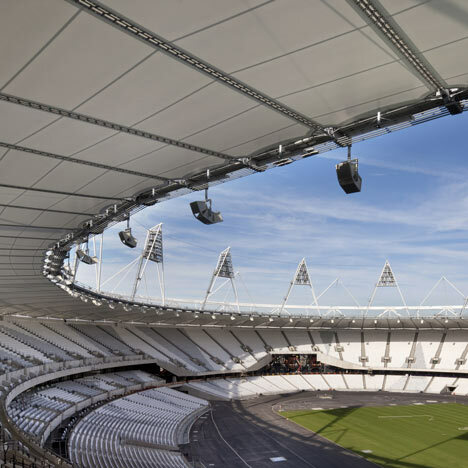 - The design team aimed to create the most sustainable Olympic stadium to date, reducing the amount of steel and concrete needed, making it one of the lightest stadia of the modern era. - It has a sunken arena so the ground level entrance is actually half-way up the stadium - reducing the number of stairs spectators have to climb to the upper tiers. - The stadium is surrounded by water, so once visitors have shown their ticket and crossed the bridge they are more free to move around than at most stadiums. - There is a spirit of fun - they have designed a space to create an amazing atmosphere, where every seat has a great view. O'Donnell + Tuomey are a Dublin-based practice. This is the fourth time they have been shortlisted for the RIBA Stirling Prize and their second year running: last year their An Gaelaras cultural centre in Derry was shortlisted. - The architects have responded superbly to considerable challenges, including the building's small, awkwardly irregular and steeply sloping site. - The distinctive red 'Belfast brick' echoes the existing south Belfast residential landscape. - The architects have created an exceptional auditorium - aiming for the seating to be twisted 'like the crease of a hand' so that people could see each other and to save actors from performing to a symmetrically divided audience. The auditorium has a special, sculptural interior and incredible acoustics. - The extensive use of glass maximises the presence of natural light in the public spaces and ensures that the magnificent view of the river can be enjoyed to its full potential. This is the second time that OMA has been shortlisted for the RIBA Stirling Prize and it is the only practice to have two buildings on the 2012 shortlist. In 2007 OMA's Casa da Musica in Portugal was shortlisted. Rem Koolhaas, who founded OMA, had known Maggie Keswick Jencks (after whom the Maggie's Centres are named) since the 1960s. Lily Jencks, Maggie's daughter, was the landscape designer on the project. - The building succeeds in the central aim of all Maggie's Centres - to create an environment of practical and emotional support for people with cancer. They aim to kindle a sense of curiosity and imagination - to be grand in ambition but small in scale. - The distinctive 'doughnut' shape of the centre allows for all the rooms to surround an internal landscaped garden. - Located in a natural setting, like a pavilion in the woods (in fact, the old hospital carpark, now landscaped) the building looks both out to the woods and into the garden giving it a sense of being extroverted and introverted. - There are no corridors or isolated rooms, but a series of interlocking spaces with a clever use of sliding walls to open and close areas, offering flexibility. OMA's second building on this year's shortlist. Allies and Morrison has previously been shortlisted twice for the prize. - Rothschild's Bank have been on the same site since 1809. In replacing their previous 1960s building, the architects created an imaginative solution to a very constrained site (part of the Bank Conservation Area). - The new building opens up views to a Wren church by cleverly creating a pathway towards the church and generous sight lines from the pavement. - The architects have created a synthesis between an office and a museum. New Court is a showcase for the Rothschild art collection, aspects of which have been carefully incorporated into the design of the building. - The building has a superb attention to detail; the materials used create a strong sense of understated elegance. This is the first time that Stanton Williams have been shortlisted for the RIBA Stirling Prize. - The laboratory is carefully designed to complement its setting - the relationship to the surrounding 19th century, Grade II listed garden is central to the building's identity. - It cleverly mixes the private and the public - the security and complex scientific needs of a laboratory with a public botanic garden café. - The architects have created a stimulating working environment to attract world-class scientists, including sociable spaces and smaller meeting points alongside research spaces. - It is a highly energy efficient building - rainwater is collected from the roof and stored in two huge tanks which irrigate the garden's glasshouse and plant chambers. "The annual RIBA Stirling Prize celebrates architectural excellence and this year we have an incredibly strong list of contenders. All of the shortlisted buildings demonstrate the essence of great architecture; they are human-scale buildings, places to inspire, entertain, educate and comfort their visitors and passers-by. Every building not only works beautifully from within but has a superb relationship with its surroundings, with a strong interplay between the two. They don't shout 'look at me' and even the tallest building, New Court in the City of London, has created good views for passing pedestrians, meeting the challenge of delivering good urban design in an historic area. The 2012 RIBA Stirling Prize judges have a difficult job to select a winner from this pool of great talent. I can't wait to see which project they choose." The 2012 RIBA Stirling Prize judges who will visit the six shortlisted buildings and meet for a final time on the day of the presentation (13 October) to pick the winner are: Sir Nicholas Grimshaw (Chair) - architect and former president of the Royal Academy; Sir Mark Jones - Master of St Cross College Oxford, and former Director of the Victoria and Albert Museum; Joanna van Heyningen - architect, van Heyningen & Haward Architects, UK; Hilde Daem - architect, Robbrecht + Daem, Belgium and Naomi Cleaver - designer, writer and broadcaster. Previous winners of the RIBA Stirling Prize include: Evelyn Grace Academy (2011) and MAXXI Museum, Rome (2010) both by Zaha Hadid Architects; Maggie's Centre at Charing Cross Hospital, London by Rogers Stirk Harbour + Partners (2009); Accordia housing development by Feilden Clegg Bradley Studios/Alison Brooks Architects/Macreanor Lavington (2008); The Museum of Modern Literature, Marbach am Neckar, Germany by David Chipperfield Architects (2007). The Observer is national media partner for the 2012 RIBA Stirling Prize; The Architects' Journal is the trade media partner for the RIBA Stirling Prize.